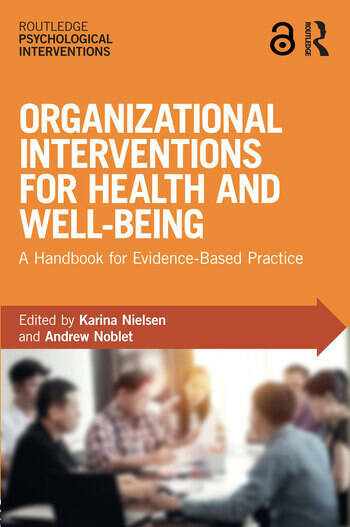 This important new collection provides not only a comprehensive overview of how organizational interventions can improve health and well-being in the workplace - addressing its causes rather than the symptoms - but also the practical issues faced in their design, implementation and evaluation. Drawing on a range of case studies and empirical investigations, it is the first book to seriously examine each element of the intervention process, and to recognize the individual, group, leader and organizational factors that researchers should consider. The authors describe the various challenges to such collaborative processes, as well as the specific methods and tools that can be used in response. Each chapter offers practical, evidence-based guidance. Featuring a final section examining new directions and approaches in organizational intervention research, the book features contributions from some of the leading international researchers in the field. It will be essential reading for any researcher or practitioner interested in the practical issues involved in improving the organization, design and management of the contemporary workplace. Karina Nielsen holds the Chair of Work Psychology and is Director of the Institute of Work Psychology at the University of Sheffield, UK. Her main research interests lie within designing, implementing and evaluating organizational interventions. Andrew Noblet is a Professor in Organisational Behaviour at Deakin Business School, Deakin University, Australia, and Co-Director of the Centre for Organisational Health and Consumer Wellbeing. Much of his recent work has focused on planning, implementing and evaluating strategies aimed at enhancing the health of works and the environments in which they work.